In today's global economy, the world's ocean resources are being hit hard. Enormous industrial "floating factories" follow the fish wherever they are abundant, and move on when they have plundered the fish stocks. In the process, they squeeze the life out of small and local fishing communities. The fishing communities of the Bigouden, on France's rugged Western coast, are determined to fight back. From the Paris fish riots of 1991, to the newly formed World Forum for Fish Harvesters, these small town fishermen have launched a sophisticated and multi-faceted strategy to stay small and successful in the face of global competition. Filmed in ports from Western Canada to France, from Scotland to Senegal, Weather The Storm introduces viewers to the logic underlying both industrial and artisanal fishing economies. It provides compelling evidence for the environmental and socio-economic benefits of staying small and local. Although the battle to save the oceans is often publicly waged between environmentalists and corporations, this film gives voice to an important group who just may have the solutions we need: the small-scale artisanal fishers. "Through a very biographical and anthropological lens, the film raises critical questions about the potential loss of artisanal fishing to a globalized and corporate model of fish harvesting. This loss would not only spell the end of unique regional cultures of fishermen and the identities they have built around their work, but also the end of a flexible system of resource management that relies upon local ecological knowledge and techniques that preserve entire species of fish. At a time when economies of global scale and fish harvesting technologies threaten to deplete fish stocks throughout the world, this film asks us to consider that the global conservation of natural resources and the local conservation of working people are often highly dependent upon each other. As such, Weather the Storm asks conservationists of all stripes to make local and global alliances with working people inthe effort to design new global models of sustainable resource use." "Weather the Storm tells the story of local fishers everywhere under pressure. 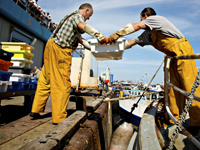 By taking a stand against industrial fleets that devastate fish stocks worldwide, fishers on the western coast of France may have just the solutions we need to save fish, fishers, and their communities." "Weather the Storm provides a compelling illustration of many issues associated with the concept of fishing down the food web, from ecological to social phenomena. The film's focus on artisanal fishers and the effects they experience from the growth of industrial fisheries captures audience interest in the plight of real people in real fishing communities. Through clear narration and English subtitles, viewers are introduced to individual artisanal fishers and learn their perspectives about the interplay of family, community, economics, and politics and their increasing concerns with collapse of fisheries regionally and globally. The film helps demonstrate the importance of evaluating potential resource management strategies such as area and season closures." "The filmmakers present the challenges facing artisanal fishermen as crucial not only for their own communities but for a healthy ocean. Weather the Storm captures their frustrations in dealing with management regimes that promote intensification and industrial fisheries, and expresses the importance of giving them a voice and a role in the world-wide production of fish. What I particularly like here is that the film brings them out of the touristic, folkloristic frame in which they're too often seen. It presents them as modern actors in a world that seems to discourage diversity - not only of species but of ways of life." "Menzies and Rashleigh provide an intimate picture of the challenges facing small-scale fishermen and coastal communities across the globe. Based on over a decade of research that fisherman and anthropologist Charles Menzies conducted in French fishing ports, the film complicates the 'dangerous simplicity' of common oppositions between industrial and artisanal fishers and between environmentalists and extractive fishery systems. Weaving together the narratives of a diverse range of informants, Weather the Storm presents a story of resistance to the globalization and privatization of fisheries to argue that 'choosing to stay local is the best way to stay sustainable.'" "Recommended for libraries with comprehensive or specialized environmental collections." includes separate version in French and scene selection.